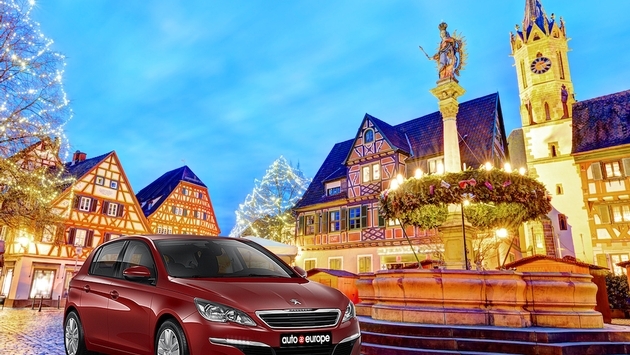 Auto Europe, a leader in European car rental services for over 60 years, would like to recommend the top Christmas Markets in Europe and offer holiday savings on travel to these events. The United Kingdom is renown for their markets with Manchester attracting shoppers from all over the world. The markets run from Nov. 14 through Dec. 21, 2014 and are located throughout the city with an array of over 300 stalls. Choices include gifts, crafts, jewelry, clothing, food and drink plus entertainment daily throughout the celebrations. Belgium is holding their annual Brussels Winter Wonders Nov. 28, 2014 through Jan. 4, 2015 and features a vast number of stalls in a true holiday atmosphere. Additional attractions include an ice rink for skating, fairground attractions and multiple light shows. The unique event boasts a perfect blend of tradition and modernity. Copenhagen’s most famous celebration of the season of Jul (Yuletide) and is featured in the Tivoli Gardens with four miles of lights arranged by Tiffany’s head designer. This Danish tradition begins on Nov. 15, 2014 and runs through Jan. 4, 2015 and some of the features include over 50 market stalls selling gifts, daily showings of The Nutcracker Ballet and fireworks. One of the oldest markets in Austria is Salzburg’s Christkindlemarkt dating back to the 15th century. Featuring over 85 stalls in downtown Salzburg offering pewter crafts, slippers, loden coats plus a multitude of holiday snacks such as gingerbread, roasted chestnuts and mulled wines. In addition, the 17th century old palace Schloss Hellbrunn, features 24 windows and is decorated perfectly as an Advent calendar. This market runs from Nov. 20 through Dec. 26, 2014. The Lille Christmas Market in France opens Nov. 19 through Dec. 30, 2014. This month long celebration is extremely popular and in addition to stalls selling arts, crafts and local cuisine, there are many events for children. The Christmas Market in Bremen is considered one of the most attractive in Germany. Featuring over 170 decorated stalls for browsing for gifts, the historical setting creates a festive Christmas atmosphere. Don’t miss the Schlachte Magic, each day featuring a live Advent calendar event on the river Weser’s promenade. The Italians celebrate the Mercatino di Natale. Trentino-Alto Adige region in the city of Trento, holds their celebrations from Nov. 22, 2014 through Jan. 6, 2015. This is one of the best markets in Italy and includes more than 60 traditional stalls with crafts, foods and decorations. Basel, considered to be the largest and most popular Christmas market in Switzerland, celebrates from Nov. 27 through Dec. 23, 2014. The fairy-tale atmosphere markets specialize in Christmas shops such as the Johann Wanner Christmas House and also features numerous concerts and guided Christmas tours. This year, Dublin is holding it’s first traditional Christmas market in Ireland. There will be more than 60 stalls featuring a unique selection of Irish made handcrafts, seasonal food and drinks and entertainment from local choirs and carolers. “Dublin at Christmas” will run from November 13 through December 23, 2014. Don’t miss Holland’s Magical Maastricht Christmas market running Nov. 29 through Dec. 20, 2014. The festivities are located all over the city, with a huge ice skating rink, a carousal and market stalls featured in Vrijthof square. In addition to shopping stalls, the Magical Culture Festival also provides festival entertainment in the theaters, cultural institutes as well as in the streets. Auto Europe offers tremendous savings on car rental, airfare and hotel services for you to enjoy these events. Don’t forget to request snow tires or chains on your car rental if you expect to explore the regions outside the markets. Auto Europe is one of the largest car rental wholesale companies in the world and services over 20,000 car rental locations in 135 countries. In addition to their guaranteed low rates and award-winning customer service, Auto Europe specializes in luxury car rentals, as well as chauffeur and transfer services. Through their tour division, Destination Europe, they also offer scheduled airfare to Europe with over thirty carriers and service 3, 4 & 5 star worldwide hotels. For additional information contact your local sales representative or Auto Europe at 1-800-223-5555. Visit their web site at http://www.autoeurope.com.